When I was shopping for a Countryman, I scoured the web for accounts of people who have put three car seats in a Countryman. I found a few, but I was still nervous buying one, since I have three kids. 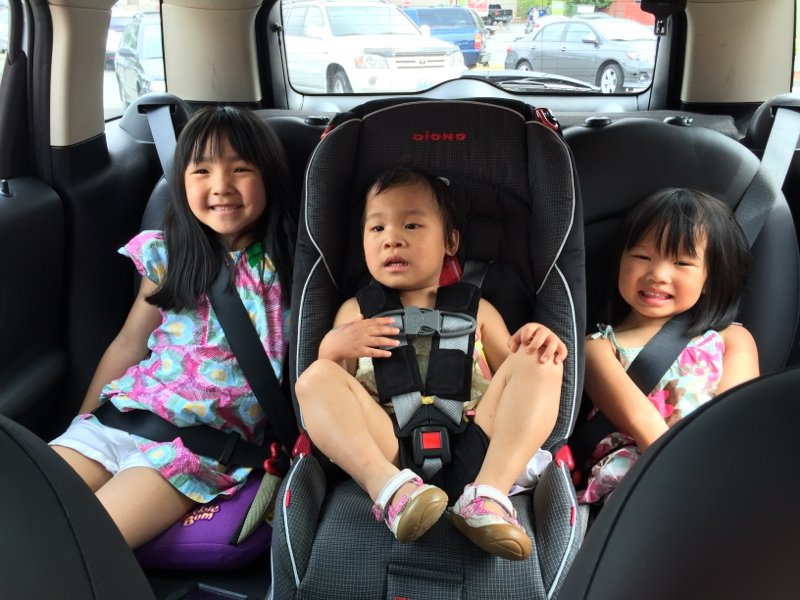 When I bought the Mini, I didn't have much need of having all three in there at the same time (our other vehicle is a minivan), but our work situations changed, and now I need to transport all three kids a few times a week. I thought I'd post what worked for me, in case others are out there looking for the same thing. I'll say that it is very tough. I have a 6yo, a 4yo, and a 2yo, and the only thing that really saved me is that my 6yo is still small enough to use a 5-point harness, instead of a booster. A booster is almost impossible with two other seats in, because there isn't enough room to reach down to buckle the seat belt. We took our first voyage last night--about a 30 minute drive to a restaurant. As you might expect, they had a really hard time keeping their hands (and feet, and heads, and bodies) to themselves, but overall it worked out fine. There's actually a decent amount of room for each of them. Anyway, this is just to have out there in case someone with the same circumstances with me is ever wondering whether and how to put 3 across the back of a Mini Countryman. It can be done, but it's not easy or cheap. As a father of 3 young kids I can empathize with you. Just finished cleaning up after a bottle of spilled juice in the back seat.....serenity now. yup, I usually drove with 2 car seats and a six foot man in the back seat, it works... With leather and kids, I do suggest you put a beach towel down across to seat so you don't ruin the leather..
Glad you made it work, especially since the Mini is not really made for it. It will get better as they grow out of the baby seats, if you keep it that long. Have you ever put the Radian rear facing? 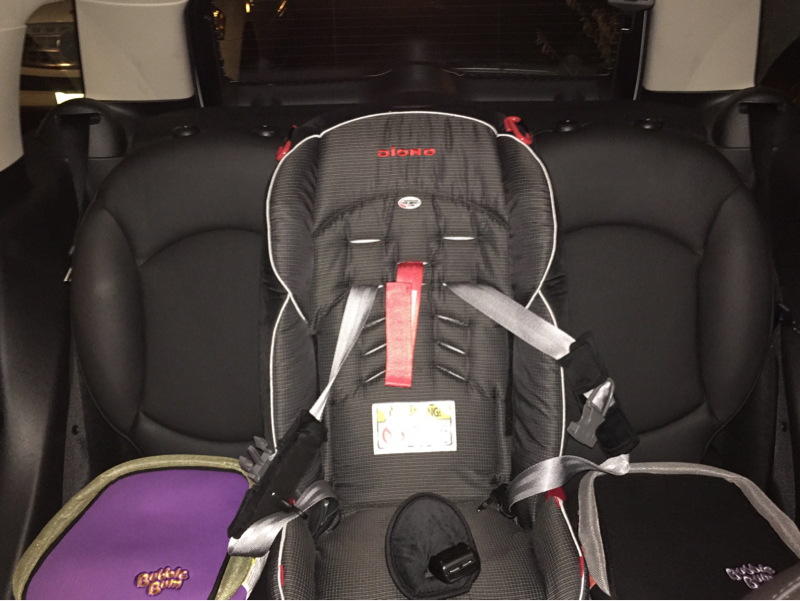 We have one 13 month old and I was looking at the radian for him but we want him to be rear facing in the middle seat....wondering if you ever tried that. 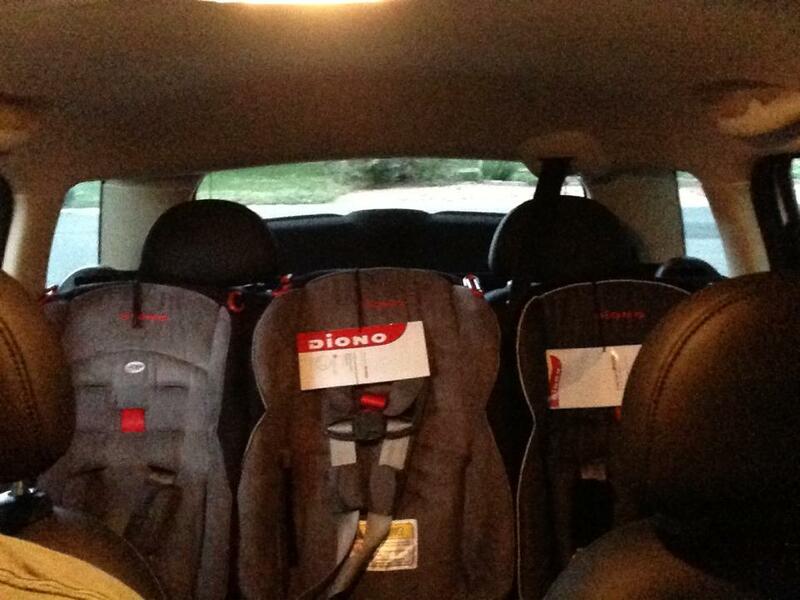 I actually started out intending to put the middle seat, which is for my 2 year old, rear facing. (She just turned 2, so she's probably better off rear facing). But the seat was too long to fit rear-facing; even with my (driver's) seat as far forward as I could stand it, her seat would still rest on the back of my seat. It's possible that there would be a narrow seat that isn't as tall as this one, but since she's 2, I just decided to put her forward-facing. Hopefully I won't have this one too much longer; I have a 3 year lease with about 26 months left on it, but I'm trying to transfer the lease via leasetrader. I love the Mini, and this works for short trips, but I've found that I really do need something larger for hauling 3 kids around for any significant length of time. We just adopted our third child from China, so we had to confront the "fitting them all in the back seat issue"; I was determined not to get rid of the Countryman. What worked for us is a Diono Radian in the middle for the youngest (2.5 years), and BubbleBum boosters on the outboard seats for our 4 and 6-year-olds. It's a little difficult to get to the seatbelt latches, but not too annoying. Surprisingly, our older girls have not complained about lack of space. I've attached photos, but I'm not sure how that is going to turn out as I am on my iPad.